"LET'S GO, STATE!!" 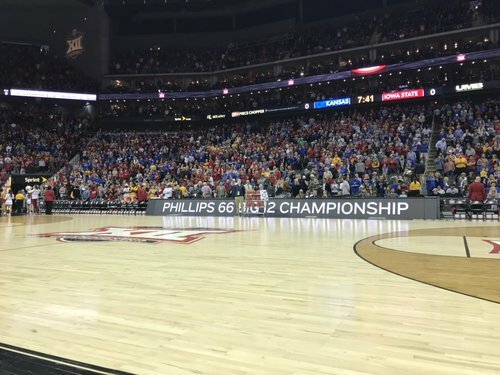 chant breaks out with Big 12 title game about to tip-off. Tip-off coming up here at Sprint Center... #KUbball and Iowa State for the tourney title. Kansas opened -2.5 in Vegas but that has been bet down to Pick 'Em in some places, KU -1 at others. Jacobson anticipates the lob for Agbaji and knocks it away. Then scores on the other end. #KUbball and ISU tied at 4. Wow - just lazy passing right now. IIRC - ISU couldn't stop Garrett driving to the rim in Lawrence. 3:55 of game time - 3 #kubball turnovers. Hell of a pace to open the Big 12 title game... Prohm telling his guys to get out and run whenever possible, #KUbball trying to keep pace. Cyclones lead 13-8 at the 13:40 mark of the first half. Self kind of laughing, saying something to Dedric as the big man heads to the bench for timeout. Presumably about the wide-open layup he somehow shortarmed a minute ago. #KUbball down 13-8 early.